I know what bad rack systems are like. 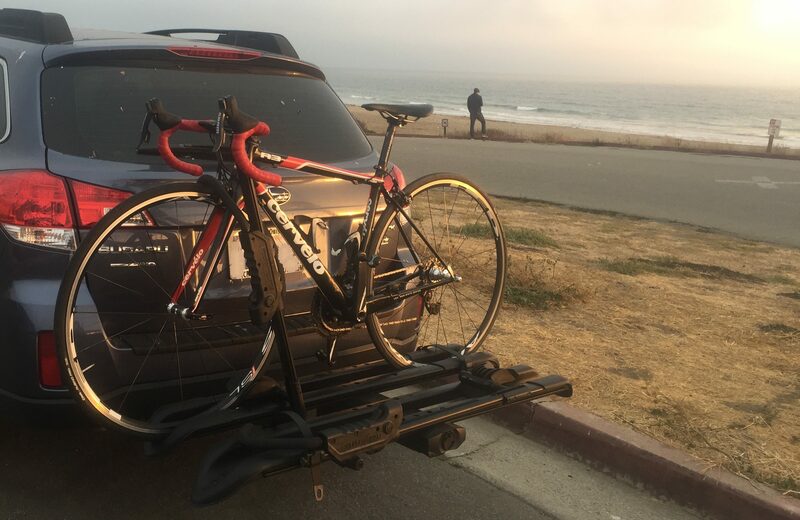 I once watched, terrified, as a good friend strapped my brand new carbon fiber dream bike onto his cheap, no-name hitch rack. You know, the kind you find on the clearance end-cap at Walmart that squeezes four bikes onto a thin steel bar and cinches them down with some random rubber straps. “Ooh, sorry,” he said to me as his crankset jammed up against my bike’s glossy pearl frame. My seatbelt kept locking as I strained to watch my multi-thousand dollar investment swaying and slamming against his beat up Cannondale. By the time he dropped me back home, my bike sported a bent derailleur hanger and several new scratches. With the memory of that ride in the back of my mind, I set my bike into the new Rocky Mounts SplitRail hitch rack. My terror quickly gave way to calm serenity (and the reassurance of watching my bikes in the rear-view mirror) because the SplitRail held those bikes in as though they were packed in concrete. Secure is an understatement. And nothing even touched the frames. Add in easy and convenient, and you’re hitting on the exact reason the SplitRail is worth every single cent. Carries: Two bikes (tested) with optional expansion to carry up to 4 bikes (added trays sold separately–for 2″ receivers only). Fits: Accommodates bikes with wheel diameters between 20 and 29 inches, and tire widths of up to 3.2 inches. Upsides: If you’re in the market for a hitch rack, and you haven’t looked into Rocky Mounts, allow me to get you stoked on the SplitRail. There were more than a few times testing out the rack that I noted aloud, “Whoa.” Impressive is a decent word to describe the way it keeps bikes riding more than securely behind your car. They don’t rock. They don’t sway. They don’t keep you wondering what’s going on atop your roof. Simple set in and ratchet down action means you get bikes on and off easily. Just swing the arm down to the outside of the rail, set the bike in, cinch down the wheel strap, and pull the swing arm back up to the top of the wheel. Tightening down the ratchet arm all the way makes sure the bike doesn’t move, and there is zero contact with the frame or other components–only a snug fit against the tire. Plus, you don’t need to remove bikes to get into a tailgate–the rack tilts down with bikes installed to allow for easy access. I’m also sensitive to the fact that the MSRP might be a bit hefty for some wallets, but this is definitely a case of you get what you pay for. This rack is worth every bit of that price tag. Downsides: If you’re not used to lugging around 44 pounds, the rack might be a bit heavy for you. If you don’t have a problem lifting the weight, it’s not difficult to lock it into the hitch. It’s a large rack that does fold up and hang on a wall, but, if you don’t have a lot of space for storage, you might look into a more compact solution for transporting your bikes. However, you can always just leave it on your car since it folds upright against the back of the car. Also, watch out for the possibility of pinches with the lever mechanism to tilt the rack up or down. I leaned into it and released the lever only to have it bite into my leg. I didn’t cry . . . much. Users of inferior bike racks will immediately notice the extremely high quality of the SplitRail. This thing is beefy, and it’s worth the investment. 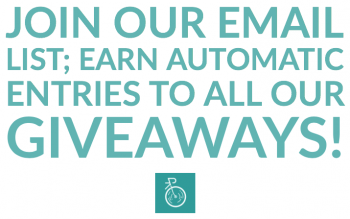 You won’t risk scratching your bikes as the swing arms don’t come in contact with your frame–holding the front wheel secure by locking down onto the tire (make sure your tires are properly inflated before loading them up). Not only is it a super simple process to load bikes into the tray, they also stay rock steady in the rack. Here’s what you’ll get out of the box. Assembly totes required. Out of the box assembly takes about 30-45 minutes, and it all goes together with an allen key. So, yes, you will need to build this puppy as it arrives in five or so different pieces. The SplitRail weighs in at 44 pounds, which is actually pretty light as high quality hitch racks go. It slides into the hitch rather easily, and even my wife didn’t have much trouble lifting it and guiding it into the receiver–but if you’re not able to carry the weight, you’ll either need to have someone stronger set it in for you and leave it on your car for good, or go with another option. I found that installing it was easy with the hitch in the upright/folded position. Once you slide it into the receiver, a wedge collar makes certain that you get a super snug fit–just twist the nob at the end of the rack’s arm until it’s hand-tight. Once it’s in right, it doesn’t rock or rattle (I noticed very little movement even going over speed bumps). Simple stuff. A simple lever just under the end of the bar pulls out to allow you to adjust the angle of the rack. Three positions let you fold it up flatter against the car (sans bikes, of course); lean it down and outward with or without bikes locked in to let you get into a tailgate; and the flat position for driving with bikes in the rack. I found the integrated lock systems pretty cool, albeit somewhat minimalist. The rack itself is secured via a locking hitch pin that slides through the receiver and the rack. A keyed lock bolt fits onto the edge of the pin. In addition, each ratchet arm has an internal cable that releases with the key and pulls out to wrap around your bike’s frame. Though I wouldn’t trust the cable lock alone to keep your bike from being stolen off the rack, it definitely would stop someone from quickly popping your bike off while you’re waiting at a stop light (it happens, folks). Definitely some cool extra features that give you a layer of security. 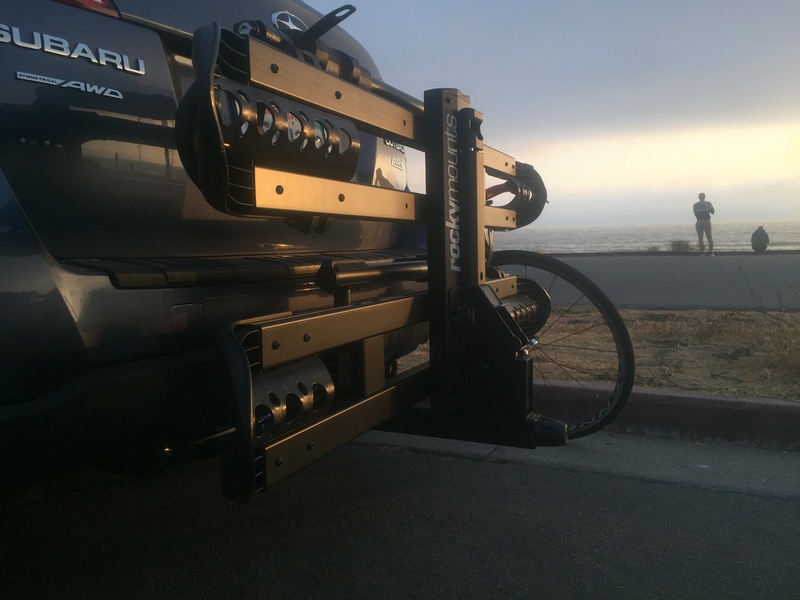 The SplitRail is definitely one of the best car rack systems I have ever used. It doesn’t seem to affect my gas mileage much, and it never rattles around or makes noise. The bikes go in quickly and easily, and the offset trays allow you to get multiple bikes in without them touching each other at all. If you’re the kind who never knows when you’re gonna need to pop a bike or two on the rack, you can leave it on all the time, and bikes of various sizes go on easily without much adjustment of the ratchet arms. Good times for those of us who are sick of having to remove wheels with other systems. Literally a few seconds and you’ve got a bike in the rack. 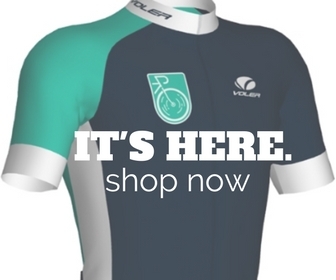 Road bikes, mountain bikes, cruisers, whatever–they all fit here with ease. 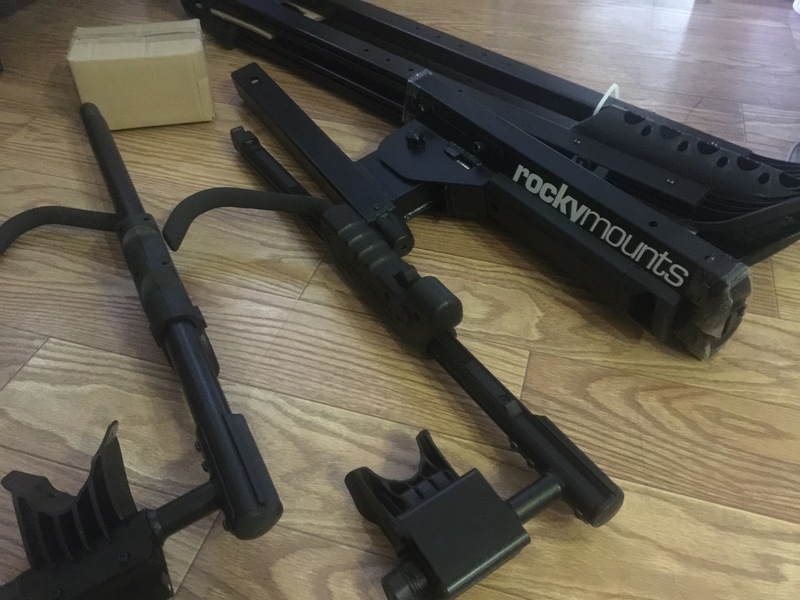 If you’re in the market for a solid, all-around, easy, and sweet rack system, the RockyMounts should definitely be on your list. It never once disappointed me. Grab some more info at RockyMounts‘ official website.